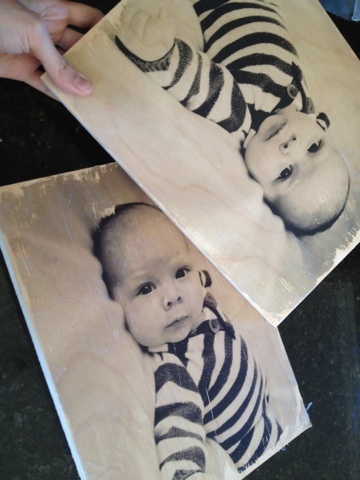 Oleander Creek: Transfer Pictures to Wood! So, for Christmas, I knew I had to give her a large picture of the little guy. 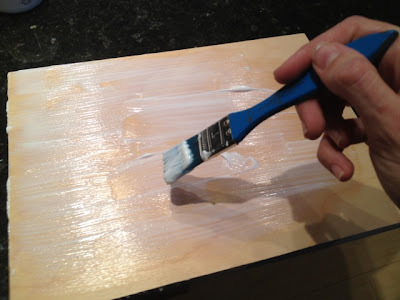 Getting photos printed on canvas isn't expensive these days, but when I saw this tutorial for transferring pictures to a wood block on Pinterest, I knew I had to try it. I wasn't quite sure how it would turn out-- but I can't resist a cheap DIY project! The tutorial is great, but for whatever reason, I just prefer written instructions rather than videos. Plus, I thought I'd share my experience and write this up in detail. 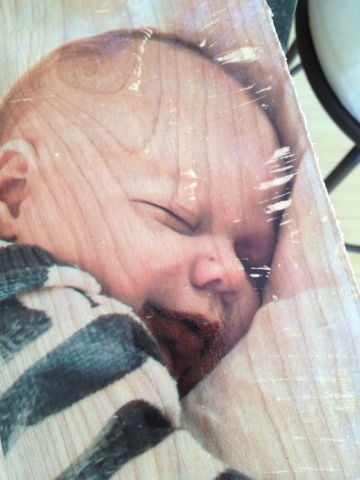 A picture printed with a laser printer. Mirrored, if you want it to look like the original when you're done. Ditzy me forgot about this when I first got these printed.. and it was a bit of a long hassle after that to get it right. Long story short-- I ended up going to the print shop 3 times in one day. Gel medium. I had no idea what this was, and went to the craft store rather hesitantly, unsure where to look for this. I found it in the oil and acrylic paint section. You know, for painting pictures, not walls. I had a 50% off coupon to Michael's, so I scored this for $7. Woot! 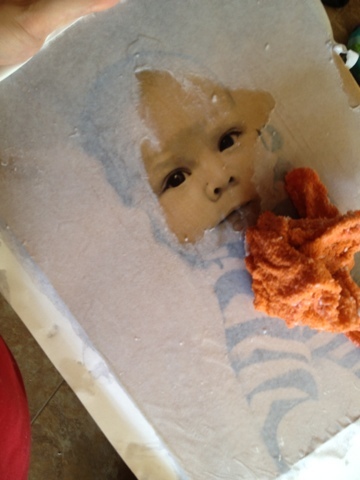 This can make for a cool effect at the picture's edges-- but it wasn't exactly what I was going for on my baby's face. When it's all fairly even, stick the picture, face down, onto the wood. Now ya gotta be patient and let this dry overnight (or until it's completely dry.. took mine about 5-6 hours). It's a good thing I made these exactly 2 days before Christmas, and had plenty of other things to keep me busy. I'm not too good with the whole patience thing. After all that waiting, here comes the reward: you get to see your artwork! Not before putting some elbow grease in there, though. Grab a wet sponge or rag, and soak your paper. You can probably hold it under running water. I did, but only for a couple of minutes, before I freaked out, and wondered if I was ruining the picture. It looked completely fine to me, But I did not have time on my side, so I couldn't risk ruining these. Rub alllll the pretty paper off with your sponge. It'll take a while. Even when it looks like it's perfectly clean and glossy-- after it dries, you'll see lots of little white specks all over the picture. It took me several rounds of rubbing and cleaning to get it right. All that hard work pays off, though-- in the end, you get to admire your amazing creation. The best part about DIY, isn't it?? What a great and very creative idea. Your my kinda person. I just love cheap(in price that is). Joining you from Robin's Link Up Party. Found you on Pinterest. What a great tutorial. Can't wait to try this. Thanks for sharing! oh I love your blog! You are fun to read and I am now one of your followers. Your tutorial was great and makes me want to try it too! Happy New Year from North Carolina! oh, I forgot to say I am from Robin's Link Up Party! I love your blog, and your ideas! Super cute! I saw your blog on Tip Junkie! I am having a linky party too, and would love if you would join! Here is this link http://www.thesouthernproductqueen.com/2011/12/27/the-linky-party-1227-1231/ Thanks for sharing! Happy New Years! Wow, this is such a beautiful project and would make a fabulous gift..
Like this wood idea a lot. Being one that likes photography I will have to try this. Also thought about having a photo done on faux canvas that WalMart & Wolf Camera offers. I just came over from Robin's link-up party. This is amazing! I've never seen a craft like this! Thanks for sharing your technique and tips! what does laser print mean? is this just a regular photo print from your local pharmacy or specific instructions? It can't be a photo print.. The picture needs to be printed on regular copy paper with a laser printer.. The kind used in most offices. FedEx or the UPS store are also great places for low-cost laser copies. What is this link up party I keep reading about??? can you do this with citrasolve? was your copy on plain letter paper? I'm sorry, I don't know anything about citrasolve, but the copies were on plain paper, yes. Oh my goodness!!! I can't wait to try this! I'm searching my walls for the perfect place! I absolutely love this! I can't wait to try it! Are you on Pinterest? I rubbed all the paper off because I rubbed some of the picture off. Could I have used too much water to start, to get the paper off. I really sponged it off with a ton of water. I really want to do this right. Your looks so great! Help??? This is absolutely precious!! Can't wait to do this with my oldest daughter. She just got married and one of her wedding portraits would look gorgeous on wood!! Thank you so much for sharing this idea!!! Did you use white printer paper or picture paper? This is printed on plain white paper with a laser printer. It does not work with inkjet printers or photo paper. After doing 3 pictures. I found out what I was doing wrong. I was used inkjet printer, gonna send the pictures to my work email and print the off there. Do you think this would work with color photos? Or is it best for black and white? Yes, I did this with color photos, and it worked perfectly! Love this! What kind of Gel medium did you use? Another way to use this technique -(works best with black and white pictures on regular paper, when I did this it was a regular photocopy of the pic) Apply gel medium to front of work (I used mod podge) but the difference here is 1 - keep the picture facing up 2- do this on a non-porous surface so that you can essentially paint the pic (facing up) onto the surface(to prevent curling). 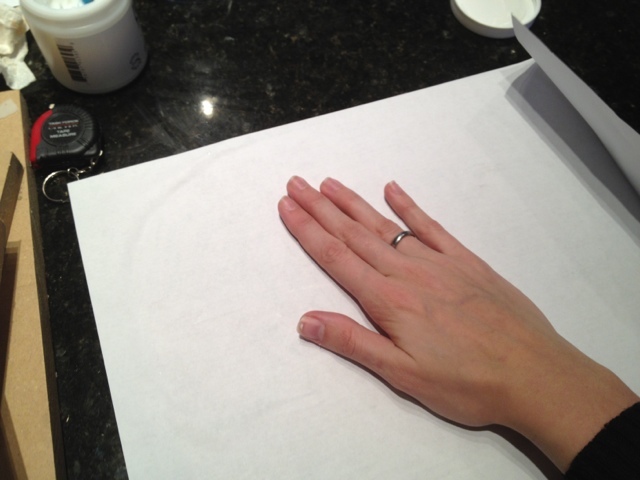 Once dry, take a razor to go around the edges of the pic, turn the pic over, and rub away the paper. The ink is left embedded in the gel, and the white areas of your picture are now clear. You can paint with colors on the 'wrong' side or throw some colored paper behind it and it looks really cool! Try it with a landscape or tree scene and you can make an instant sunset! I don't think it would work over paint, sorry. You could always try it out in a small, inconspicuous area, though! Amazing DIY! I can't wait to try it out! What type of gel medium did you use.. like matte, gloss, etc? Can you use prints from a deskjet or does it have to be laser? What kind of paper should you use....? Do you have to use Gel Medium or can you use Gloss medium & varnish? I tried it but I didn't use enough gel medium! It helps to see your project in person! I'm trying it again! Thanks! I can't wait to try this myself! I tried this over and over. It didn't work. Waste of time, waste of money! I have done this using coping machine picture and one using laser picture. I used gel medium, flipped picture over and let it dry overnight. 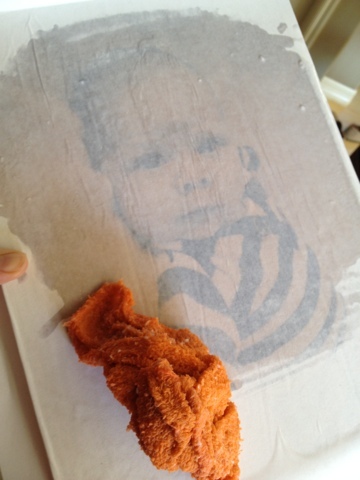 Still, wetting it and removing paper gently, its taking the picture off. I tried over and over again, sanded picture off oak wood and still can't get it to look good. Any advice? I have managed it with an inkjet printer...I just made sure in the wetting stage to get the paper just barely moist and let it dry for a second, you kind of just have to have more patience (I suspect because I haven't tried with laser, but it clearly says even with the laser ink it takes a while) I completed the entire thing in 4 hours even with drying time...you have to choose pictures carefully because blacks turn red and greys turn green but blues turn out amazing. Not sure what I am doing differently but I ended up with some pretty good (not perfect) pieces of art. Do you have to use a gel medium or could you just use modge podge to apply the picture? Btw my modge podge is matte finish if that makes a difference. Help please! Yes, gel medium is required. Just modge podge is not going to transfer the picture. I did a few of these a couple of days ago and they turned out GREAT!! I printed the pictures at Staples using their self-serve usb colour copier (about 0.44$ per page, I was impressed with the quality too!) and used Liquitex gel medium. I was worried that the pictures wouldn't transfer, but they transferred COMPLETELY with only a thin layer of the medium and about 6 hours waiting time. The "difficult" part was getting the paper off and it seemed like I would never get the paper fully removed. I took some advice from another page and used a bit of vegetable oil to remove the cloudyness from the picture and immediately applied the mod podge after. The cloudyness was gone for good! I think there is still a bit of oil residue left over, but that can be wiped clean and you can apply another layer of mod podge for good measure. Thanks for this DIY! I have the same problem. Once I wet the paper to remove it, the picture comes with it. I've tried letting it dry then attempting to remove the rest and its the same. Its almost like the gel medium doesn't stay solid when its wet. can I not use certain types of wood? 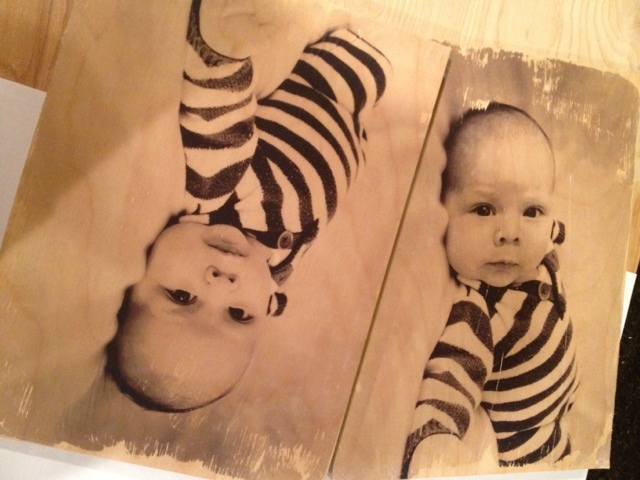 Does this picture transfer onto the wood or is it still partly paper in the end product? Ahhh, forget the paper! This is a mess. I have 2 hanging in my office and they look great. thanks a ton for the idea I will try it on my projects too. That would be a sight seeing a man panicking about his half-finished job being ruined. The horror. But you did a great job with it after all the trouble. Happy to find a written out tutorial. I don't care for videos, this was much easier for me. Thanks! Thanks for sharing! This works great!!! As far as removing the paper after 5 hours drying, I put my project under warm running water, then after about 30 seconds in the water I kept it in there and slowly and GENTLY started rubbing away at the paper with my thumbs. Very little pressure, took my time, and the image was transferred perfectly. A 2"x2" image took me about 2 minutes to completely clear of the paper. Looks so cool! I have a cannon printer, uses color and black ink cartridges. My photos are transfered from my phone to my computor, then I usually transfer onto photo paper, can I just print the picture onto regular copy paper then go somewhere that has a laser printer and get a copy made to transfer to the wood? The only thing I'm wondering is.. if i have an image where the background is white, when i transfer it onto the wood and rub it off, all the white areas (including the background) gets rubbed off and becomes the colour of the wood itself. Is there any way I can make the white areas remain white instead of it being wood? I only want the piece to be wood but the image itself to still be the original state? Also, is there any way to brighten up the image? Because I tried and when transferred, the image colour becomes darker than the original. Thought of playing around with brightness and contrast in photoshop but not sure if that would work and how much of the brightness and contrast needs to be changed? I thought it couldn't be done, but this goes to show that it looks really great! Love this idea! ... you are the only one that made it sound easy. 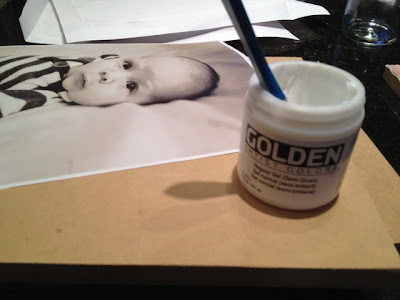 I am going to try this with pictures I have taken of the grand kids. thanks!! Cheap, Easy, and Fast.. What's Not to Like?! I'm a cheapskate. I love making things and decorating. I love my family.